Address: Commandant School of Artillery Nowshera Cantt. 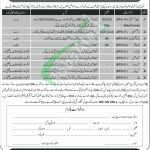 Recruitment offers are before you from School of Artillery Nowshera Jobs 2018 For BPS-14 To BPS-01 Latest. Applications are being offered for the natives of Nowshera Cantt from School of Artillery Nowshera who possess the nationality of Pakistan are welcome to apply for BPS-14 To BPS-01 vacancies which are given below. Applicants who are talented, caliber and expert applicants are required to apply for the following posts which are named as (Computer System Manager (BPS-14), Draftsman (BPS-11), Press Machine Operator (BPS-04), Carpenter (BPS-04), LRO (BPS-01), Cook Mess (BPS-01), Gun Labor (BPS-01), Mali (BPS-01)) are the posts which need to be filled by the eligible applicants. Candidates willing to apply should hold MSc/BSCS/DAE/Matric/Middle applicants with relevant expertise are needed to apply for such posts. Age limit should be 18-30 years. All those applicants who possess the domicile of Punjab, Nowshera and its nearby towns are eligible to apply. All those applicants who are looking for jobs in such department and are in search of such jobs so minimum educated applicants must come and apply for these positions. Now, let's head to have it further details below. Applicants are required to send the application in the prescribed format. Applicants need to attach the Postal Order of Rs.300/ in favor of Commandant, School of Artillery Nowshera Cantt along with the application. The last date for applying is November 29, 2018. Late received and those with incomplete applications will stand rejected. Last Date To Apply: November 29, 2018.